Many sailors crossing the Pacific choose not to stop in many of the Tuamotos atolls due to the challenge of navigating the reef passes — the currents can be extremely dangerous, flowing up to 10 knots, occasionally creating standing waves to 2-3 feet. Predicting when it is safe to navigate a reef pass can be tricky. Sailors often talk about “timing the slack tide” in Tuamotos passes, but this is somewhat misleading. What is really important is the overall current in the pass– which is caused by a combination of tide, swell and wind. The tide has the most obvious effect on the current. Luckily the tidal variation in French Polynesia is only about 1-2ft, but the atolls are so large that a formidable amount of water still needs to move in and out of the lagoon twice a day. Slack tide is normally the calmest time in a reef pass – assuming there is no wind and swell. The wind can seriously disturb the pass when it is moving in the opposite direction to a strong current, resulting in confused standing waves. So we avoid transiting the pass when wind and current are in opposition. An even more significant hazard for the pass, however, are the swell conditions. If there’s a moderate to large swell (2m+) there is a huge amount of water that is poured into the lagoon. Satellite images and nautical charts make it seem like the atolls are a complete ring of land, but the majority of the ring is actually submerged reef with a peppering of motus ( little islands of land in the barrier reef). Waves can come from groundswell (far away storms, with large periods) or windswell (localized strong winds with short periods) such as the ‘Maraamu’ South-East trade winds that blow 25knots+. The extra water these swells push into the lagoon must escape through the reef pass. This creates an additional outgoing current of 1-6 knots. When this swell-driven outgoing current combines with an outflowing tide, a river of water can flow towards the ocean at an incredible 8-10 knots! Even a big ship might have a hard time during such conditions. The best time to enter a pass during such a swell event is usually during the peak of an incoming tide, so that it neutralizes the outgoing current. Then, the outgoing current may be a reasonable 1-2 knots. Therefore, in the case of swell events, slack current is NOT slack tide. Note: swell can also create large waves that break next to narrow reef passes making them difficult to impossible – like Maupiti in the western Society Islands. This is an entirely different problem, but still relevant for navigation! Naturally, it’s best to travel across reef passes when the swell and wind is moderate, and tide is slack. But we don’t always have that luxury. Being able to factor for the effects of swell and wind is critical for the safe navigation of reef passes in less-than-ideal conditions. PHOTO: shows the Tiputa pass in Rangiroa. It is a 40 mile wide atoll with a huge amount of water moving in and out of the pass, generating large standing waves which can be seen on satellite images. This famously attracts dolphins, which divers come to swim with. We entered Tiputa pass after waiting an hour for the tide to shift, and still the outgoing current was nearly 6 knots. However we were blessed with an amazing moment when a huge dolphin jumped directly in front of Aldebaran as we were barely moving forward with the engine at full throttle! 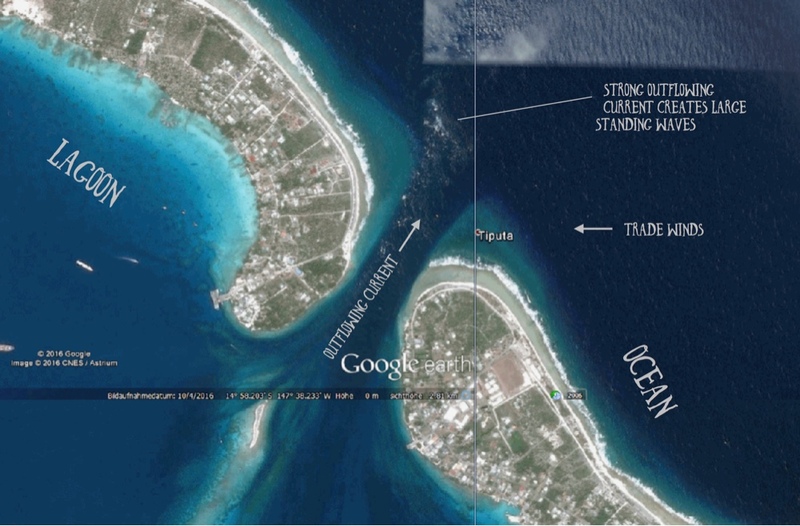 ← Rangiroa, and the resurrection of Honey Bee!